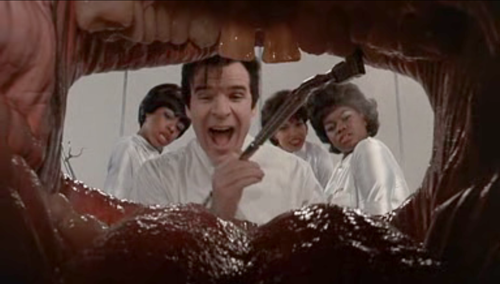 I just got back from a checkup at my dentist’s office. The hygienist said my teeth were looking good and needed minimal cleaning. My dentist checked her work and said everything was just dandy, so that was good. I told them that my nightly red wine wash was obviously working. They agreed, somewhat reluctantly. I asked if they had free bacon flavored mouthwash. No deal. But they laughed. All that plain vanilla cheer and professionalism made me nostalgic for the dentist I had when we lived in Georgia. He was funny. Irreverent. And excellent. We carried on conversations much like the one that follows, and I am not making this up. He begins poking around in my mouth. He works around inside my mouth some more. Dentist: “Hmmmm, I didn’t think you would bleed quite that much. Interesting. A little more suction, Susie,” he says to the hygienist assisting. And so on. It’s fun having a noir dentist, and I miss him. This entry was posted in Random Thoughts and tagged Bacon, blood loss, dentist, Little Shop of Horrors, Mouthwash. Bookmark the permalink.